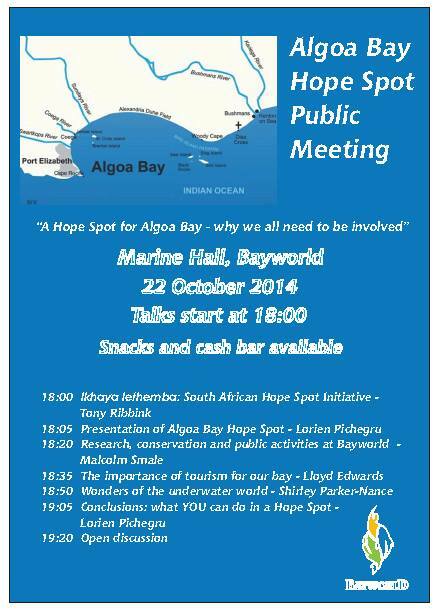 The Algoa Bay Hope Spot will be launched by Dr Sylvia Earle on 11th December 2014, and recently Raggy Charters own Dr Lorien Pichegru became Committee Chair of the ABHS council. Her roles are to help organise public events and raise awareness about marine conservation within Algoa Bay, and the rest of our oceans, help put our hope spot on the map as one of the most important marine areas, help engage the community around our hope spot to ensure sustainable use of our enviroment, and to help raise funds to promote marine conservation and education. No easy task, but with someone as passionate about our bay as Lorien is we are positive that the Algoa Bay Hope Spot will become a huge success and really get us on the global map! 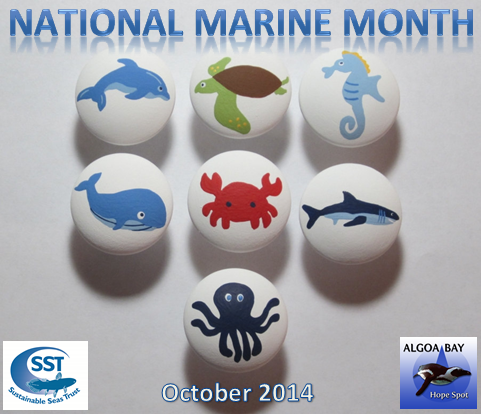 This October we have been celebrating National Marine Month and ABHS has been using this time to try and educate and enlighten the community about our marine environment; the amazing creatures we see in our bay, and ways in which we can enjoy it, and protect it. The ABHS facebook page has been making regular posts with this information and we hope everyone has found them enjoyable. South Africa also celebrated Marine Week from 6th October til the 12th October, however, here in Port Elizabeth we will be celebrating Marine Week from the 20th October until the 26th. During this week SANCCOB will be hosting school children daily with displays about various aspects of the marine life in our bay. And the Algoa Bay Hope Spot will be visiting schools daily to do a marine presentation, with photo and drawing competitions to try and get the kids excited about the ocean. ABHS will also be holding a public meeting on Wednesday October 22nd, from 5:30pm which we are encouraging everyone to attend. There will be various guest speakers so it should be an informative event! It will also allow the public to voice their opinions and make it a real open discussion.